These days, I try to stick to whole, plant-based food as much as possible. 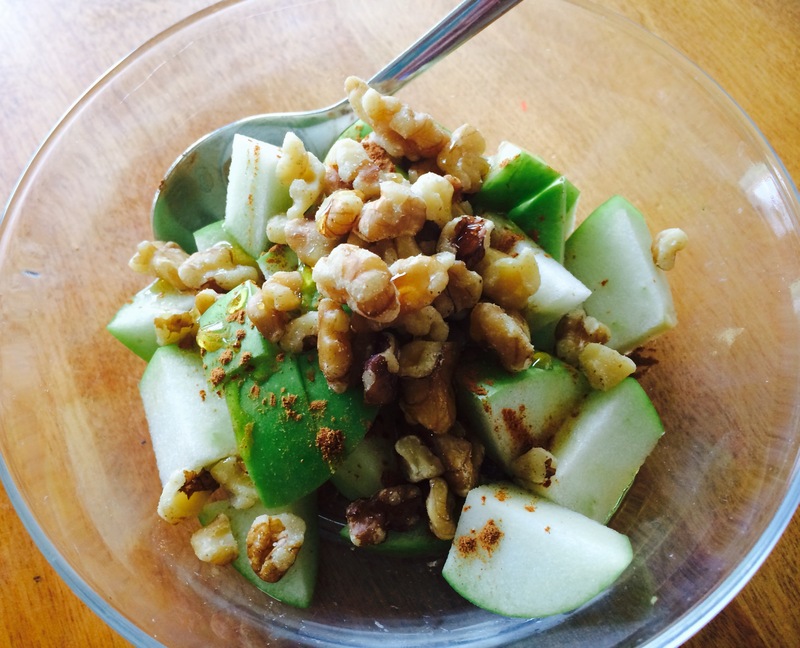 A bowl full of chopped green apples, a handful of walnuts, some cinnamon and a drizzle of honey or agave is so amazing. Simple. Quick. Healthy. Satisfying. I love this combination of flavors and textures. Today, I made an easy rice porridge. Just a half a cup of leftover rice. Any kind is fine. I used Volcano rice from Lotus Foods that I had made the night before. I chopped some banana, added coconut chips and canned coconut milk. I warmed it in the microwave for one minute, you could quickly warm it on the stovetop instead. Then I topped it with fresh bananas, toasted coconut and a little honey. Oh man oh my. Last week, I was obsessed with pumpkin. I just started adding it to everything after a friend told me about the pumpkin hummus she had made. So my regular oatmeal got a little more exciting with the addition of canned pumpkin and cacao nibs. I like to simply warm my oatmeal briefly, so it still has texture. If you prefer softer, mushy oatmeal just cook it longer. Starting the day with some satisfying, grounding foods can give you the focus and energy you need to get whatever needs to be done, done. All three of these breakfast bowls should sustain you until lunchtime. I also like to drink warm water with lemon or chai tea in the morning. So nice to start the day grounded, centered and calm. Chop apple into large dice, leaving the skin on. Place in bowl and top with walnuts, a sprinkle of spices and drizzle of honey or agave. 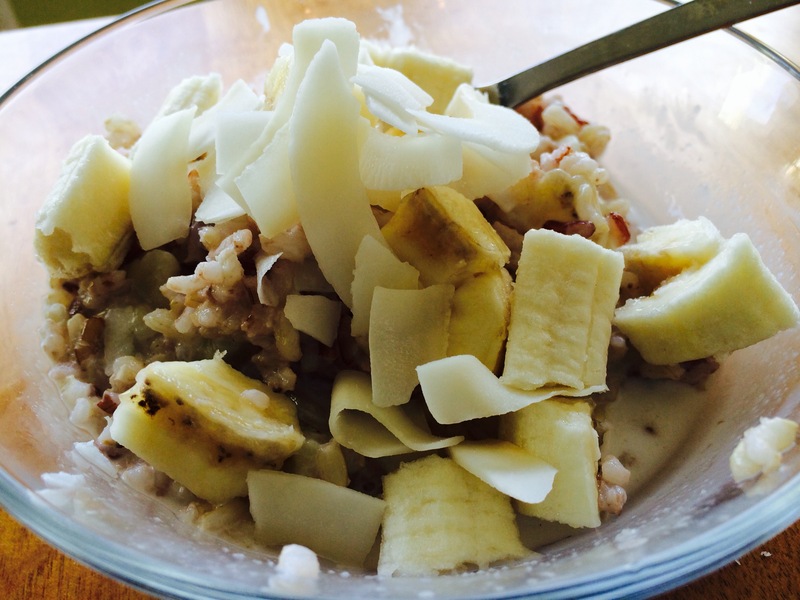 Combine rice, coconut milk, 1 Tbsp coconut chips and 1/2 of the diced bananas in a bowl. Warm in microwave for 1 minute or place in a small saucepan and warm on the stove. Toast remaining coconut chips, if desired, in a saute pan on the stove. Top rice mixture with the remaining diced bananas and the toasted coconut. Drizzle with honey or agave if desired. 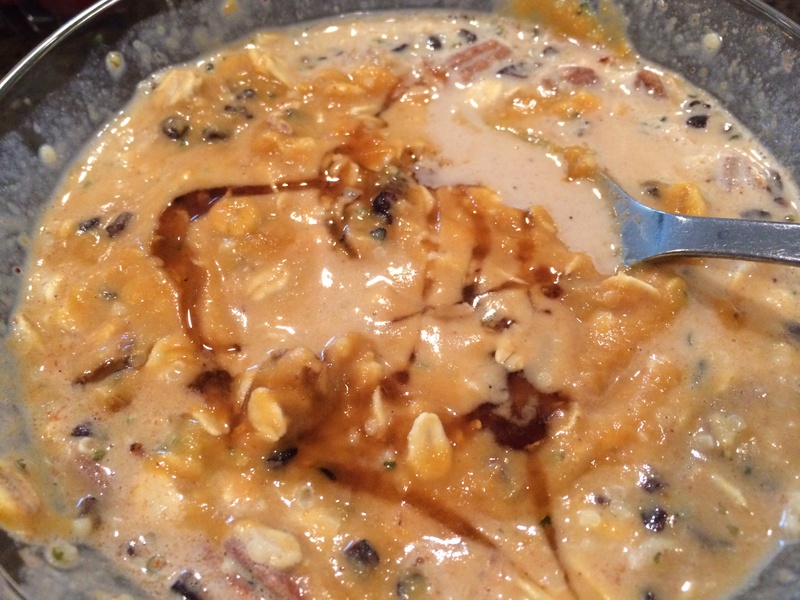 Combine oats, almond milk, nuts, seeds, pumpkin, cacao nibs or chocolate chips in a bowl. Warm in microwave for one minute or cook on stovetop in a small pan. Can cook longer depending on the type of texture you prefer for your oatmeal. Add more almond milk if needed. Top with spices and maple syrup if desired.